I have recently attended a cooking-demo class with Panasonic. It was not only inspiring, it was also extremely tempting. All because I got inspired to home make our daily bread which eventually convinced me to wana get a bread maker! You have no idea how much satisfaction and how much of a healthy eat you're getting from the home made. 2. Select mode no. 2, press start. 3. In last 10 minutes, stir dough with wooden chopstick. 4. Once ready, cut dough into bite size and coat with peanut mixture. Perhaps, it's been years since I tasted muah chee, the taste was soooo good! Homely and healthy. The cutting and coating of the dough with nuts didn't seem easy, a good tip is to coat your scissors with some oil to ease cutting. The really best part about these was tasting them fresh and warm! What are the chances of getting warm bakes from the bakery? I hardly chance upon that. Didn't really do an extensive research on bread makers, but Panasonic SD-P104 seems like a good investment. It's simple operated with crust colour control, comes with raisin/nuts dispenser and yeast dispenser that dispenses yeast at the proper time. You can whip up anything from bread to dough and to dessert. Still in the state of cooling off before acting on the decision to buy a bread maker, I'm just concerned if I'll be committed to bake off our daily bread and at the same time, weighing the chance of it becoming a kitchen ornament. Disclaimer: I was invited to attend a cooking demo class with Panasonic. No monetary compensation was given. All photos and opinions are solely mine. Some weeks ago, we were watching a programme of the less fortunate on TV. We got teary throughout the show and my heart melted when Jazz asked if I could do something for the less fortunate. I attempted to google into the needs of some charitable centres and thanks to great awareness and publicity, I came to know about the Boys Brigade, 'Have a heart, share a gift' campaign. Before you think about the hefty fees spent on adverts, their PR firm did everything for them on a pro bono basis. Here are some faces on the publicity - lil blue bottle and In the Wee hours. Genuine volunteers! Walk in and out of some NTUC supermarkets, and you'll find the boys brigade booth, collecting food donations. Would really be nice to get something from the store for their beneficiaries, 35,845 of them. The low income families. It's the last day of collection tomorrow, 17 Dec.
Other than food donations, you may also volunteer your service for delivery. Having had food collected, packers to pack, all will be completed only with drivers to deliver. The man was away and I thought I should volunteer his car. We signed up to be the driver today! After 3 deliveries, 2 pit stops and 1 'not at home' delivery, I was so exhausted! I fully understand the hours of a taxi driver now. Nope, not a snack from the hamper. ha! It took me much courage to volunteer this role. All because I'm very uncoordinated with road directions. It didn't help much when GPS don't work very well in our densely build up houses. I was a few times, missing turns and exits. At the end of everything, I returned to the Boys' Brigade HQ almost drained. I'm however, so thankful for cooperative kids today! It was an eye-opener for them and me. Just when I parked and was ready to step out to return the delivery slips and undelivered bags, I received a text from my friend, mentioning that I won a lucky draw. My Dad always tell me not to expect rewards in sowing kindness. I know it's sheer luck, but in disbelief I almost teared. Emo queen. It was definitely good comfort after some challenging work done. Maybe there really is some essence in saying kindness begets kindness. In whatever your belief, a heart of sincerity will never go wrong. All my life, good deeds are not meant for light, but for inspiration. It really didn't cost much to donate food or do some deliveries. I know my 2 successful deliveries weren't very significant, but at least I made a difference to these 2 families. I may not know their story and hardships, just like how we say, "you will not know my hunger, because you're filled." I hope these goodies brought them some smiles and joy today. Online food donation can be done here ($30 or $50) hamper. On the boys from the Brigade - it's the school holidays and you know how hard they've been working? 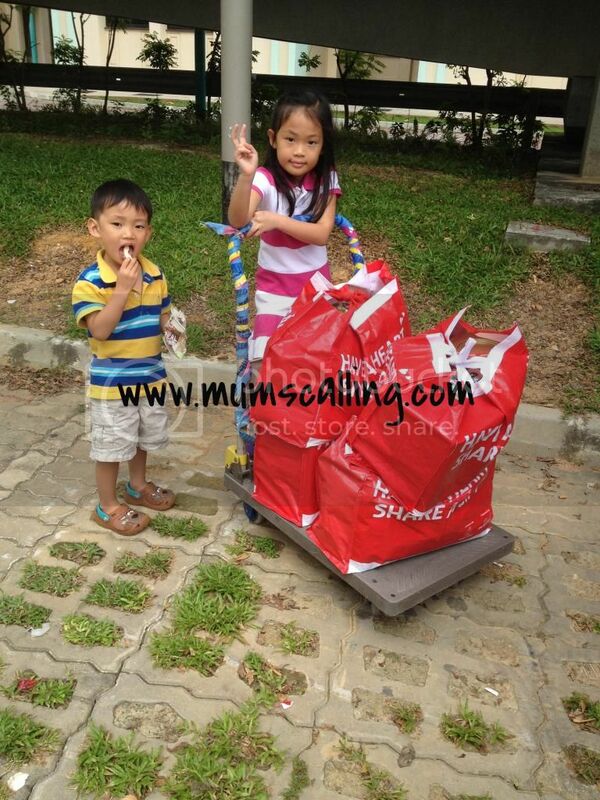 I saw them toiled and sweated it out as they loaded the hampers onto cars after cars. They weren't light and there were just so much coordination to do. Good job, boys! It was also extremely heartening to see families and individuals coming forward to volunteer their time and contribute food to the hampers. I say, Singaporeans are a bunch of kind people. Join in some kindness movement today! In preparation for a new year, some parents and kids are sure buzzing busy preparing for school. For some, it will be another new year of school, for others, it might be the first day of school. 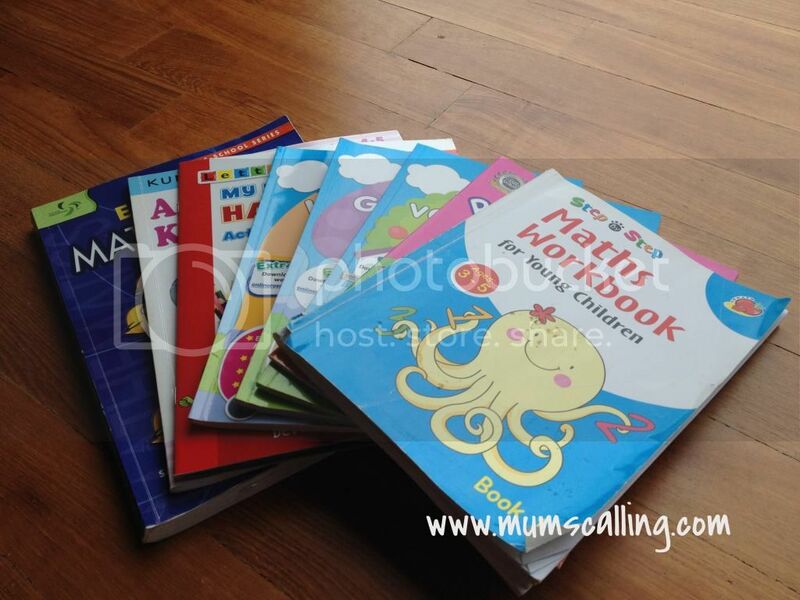 What would be the best preparation for new schooling kids? Or the already schooling kids with new gadgets? Name labels! I would say. We've recently received 2 sets of name stickers for Js, which included clothes, shoes and small stickers. They were not only easy to order online, they were also speedy to arrive in the mailbox. 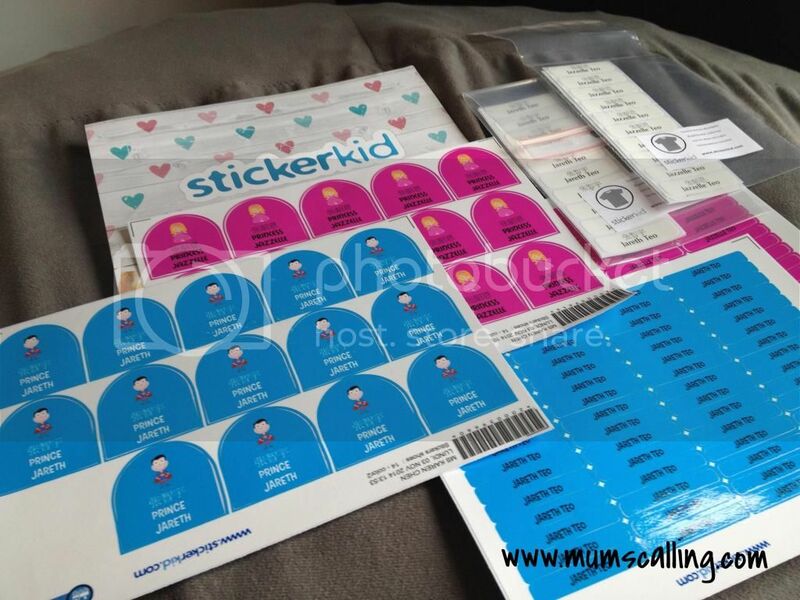 Sticker kid makes life easier for parents and teachers with their attractive and durable labels and stickers. These quality stickers are formidable. They survive microwaves, dishwashers, water, sun and sand! So yeap, anything from water bottles to snack containers or even personalised cutlery, they will withstand the rough and tough journey. What more through the hands of our little rough handlers. Labels can be gender coloured too! I love it that they have shoes labels, shaped to the perfect heel corner of any shoes. Once, Jazz had her shoes switched with her classmate, only to discover the mistake 2 days later when I was approached by another Mum. I had never thought of labelling shoes, as I didn't think there were so many similar white school shoes existing. Cinderella story convinced me that feet sizes are unique too. Oh well, I do know we need to label shoes now. Their Clothes labels can be used not only for wears, but can also be iron onto their little cuddly toys. It withstands up to 45 rounds of high temperature washing. These name labels aren't usual. Other than the flexibility of choosing from a variety of colours, logos and shapes, you can even upload photos on the stickers and print Chinese characters on it. They are made using the highest quality materials and every label is protected with a scratch resistant thin plastic layer to ensure that it withstand challenges. All their products are made in Switzerland with no compromises. Hurray on its expansion to Singapore! Impressive huh?!! Here's a nice deal for you, if you're keen in printing or gifting these name labels, check out your cart with the following 10% discount code: Hello1512. Code valid from today till 28 Dec 14 only. This code offers 10% discount on all products, even the value packs. Just enter the code in the field for discount codes and the total amount will factor in the discounted price. Happy shopping! Disclaimer: We received 2 sets of labels for the purpose of this review. All photos and opinions are solely ours. I hope you aren't running out of places to visit or soak up for the festive spirit. While there are lots of events and places out there for you to touch foot on, I will say we had tremendous fun in Universal Studio! Great play with unending excitement within. Being crowd adverse in nature, we had planned and decided to visit the theme park on a weekday. I thought we were being wise to shy the weekends, but there were still some long ride lines and crowd within the park. Not overly crowded though. We stepped foot in the park at about 11am, and left exhaustedly at 9pm! It was some good entertainment we had, and we clearly didn't forget about playing hard. Very much blessed with great weather too. The park sectioned in 7 themes - Hollywood, Madagascar, Far far away, The Lost World, Ancient Egypt, Sci-Fi city and New York. 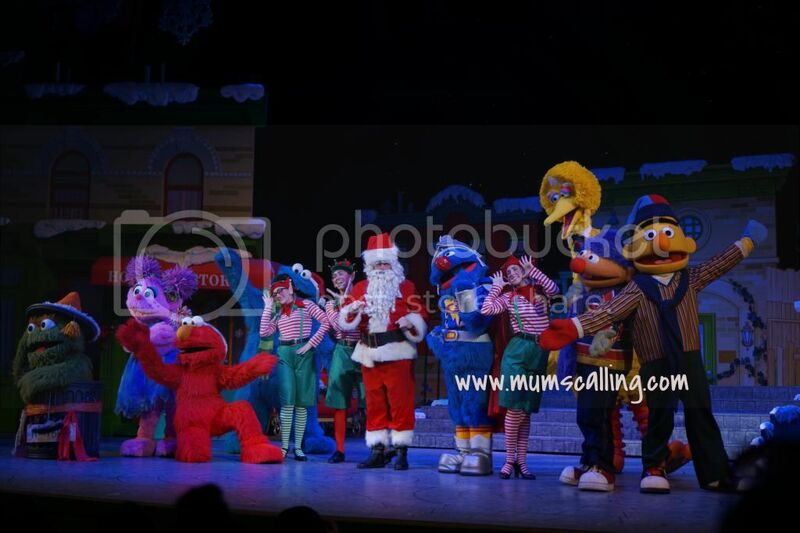 We caught the awesome show of Sesame street saves Christmas. A live show to the short story of Rudolph the Red Nosed Reindeer who fell sick from shooting a movie, leaving the fate of Christmas to Sesame Street friends. A lovely production that had bagged off the following award: 2014 IAAPA Brass Ring Award Winner, Live Entertainment Excellence: Overall Best Production. Go ahead and fill up the front rows if you're early. This is probably the only time when you have the up close experience of a live show with no hefty price to pay for front seats. First 5 rows give you snowy experience and sitting along the inner aisles give you good chance to hi-five the characters too! It was an interesting opportunity to catch a rocky and rappy Santa in the show, which I thought was really cute. Don't forget to catch the adorable minions from Despicable me at Hollywood too! If you arrive on time for the meet and greet, you'll be able to catch them dancing to their version of Chrstmas songs. Totally cute! Though I'm constantly wondering if the use of child labour was involved. I thought I had been a dwarf till I met them live. And we caught Dear Santa! Oh, we love the Santa here because he looked like he came all the way from North Pole. Not sure about you, I don't really fancy Asian Santas. Perhaps, it's more convincing that 'real' Santa had arrived with good news that he received our wishlist. I challenged Js to brave up on telling him their wish list, but they were not up for it this time. While you're hanging around Hollywood or New York, weather forecast says there is a high chance of snow that falls hourly! 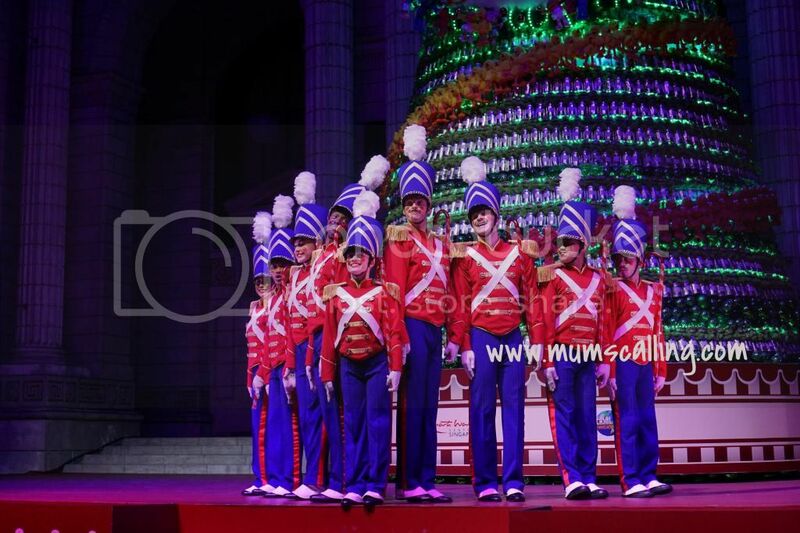 Do catch the Madagascar boogie performance too, if you're fans of the casts! So yeap, another young child friendly area. Jare was exhilarated to be able to get on the enchanted airway, a junior roller coaster ride! Look out for the street show, The dance for the magic beans. you'll spot puss in the boots entertaining you. 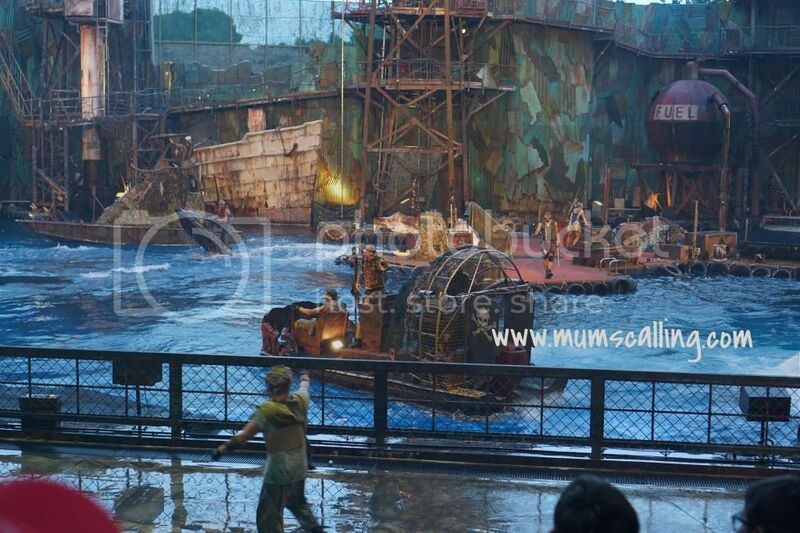 WaterWorld performs the death-defying stunts with loud shocking explosions and sounds. Great thrills within, and a good watch. However, loud sounds might startle the really young ones. We arrived lost world at about 2pm, and there were long lines to almost all the rides. We queued for the shortest line we could spot (20mins) and left with a decision to come back for conquer later. Best decision ever, because when we were back at about 7pm, there were no lines to the rides. We could even go multiple times. We tried to look out for the meet and greet with the Velociratoprs, but to no avail even though we were on time. We have no idea where the meet and greet spot was held at. Sigh! Treasure Hunters seemed to be a new ride as we've never seen it on our past few visits. Let me warn you kindly, if you queued like 45 mins for this, you'll go cursing and swearing at the end of it. It's rather crappy and unexciting, only good to wow the little visitors. If you've no kids, forget it! Unless no queue. 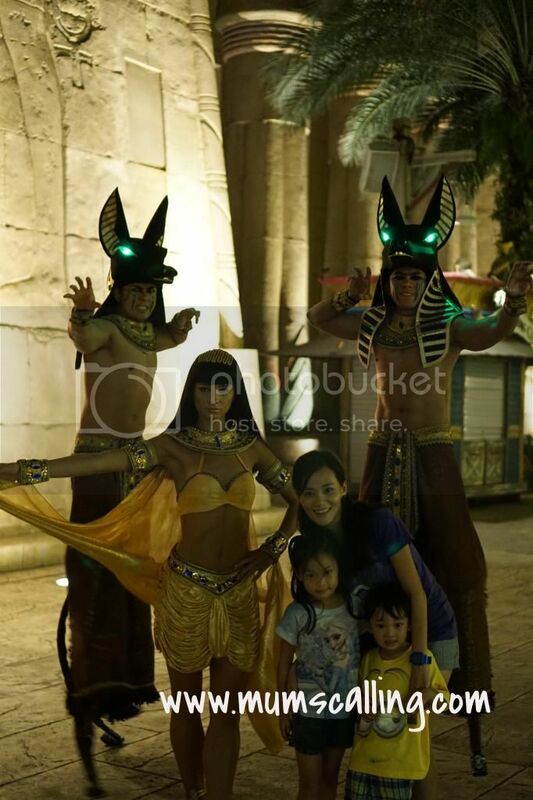 I challenged my Dad to get on the Mummy ride with us, and he took on the challenge! Not once, but twice! Most cool Dad I ever ride with, he was laughing while I was screaming away. Again, no queue at 7pm. So love this exciting and thrilling high speed, indoor roller coaster ride. A good chance to train up bravery. 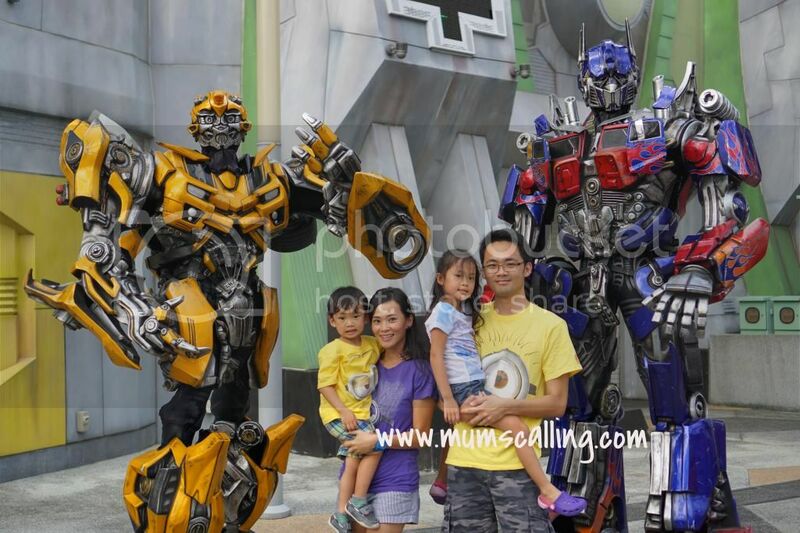 The highlight was meeting the transformers, Bumblebee and Optimus Prime. You've no idea how excited Jare was to meet them. He wouldn't take his eyes off them. Glad to finally capture his attention for a good shot. To catch a shot with both Bumblebee and Optimus together, we rejoined the line after a shot with just Optimus. For the first 10 minutes, Optimus was alone, then joined by Bumblebee for 7 minutes before Optimus retreated, and Bumblebee was left alone for meet and greet. Am I confusing you? Just approach the friendly staff on site. You know you're nearing the exit when your day had been fun-filled to great content. The big apple city, New York is happening! We caught the street entertainment by rockafellas, who showed us the real stuff of B-Boyin. Cool street dance! The spaghetti space chase was also another new ride which we didn't spot on the previous visits. It's where you should bring your little ones if they don't have a heart for spaghetti. He might ask you for a plate of it after the ride. I was very impressed with this ride because Jare who just made it slightly over the 92cm mark was given a go on the fixed booster seat. Totally awesome that he doesn't have to overwork his neck to enjoy the viewing journey. Good move! Catch too, the Sesame street stage show. 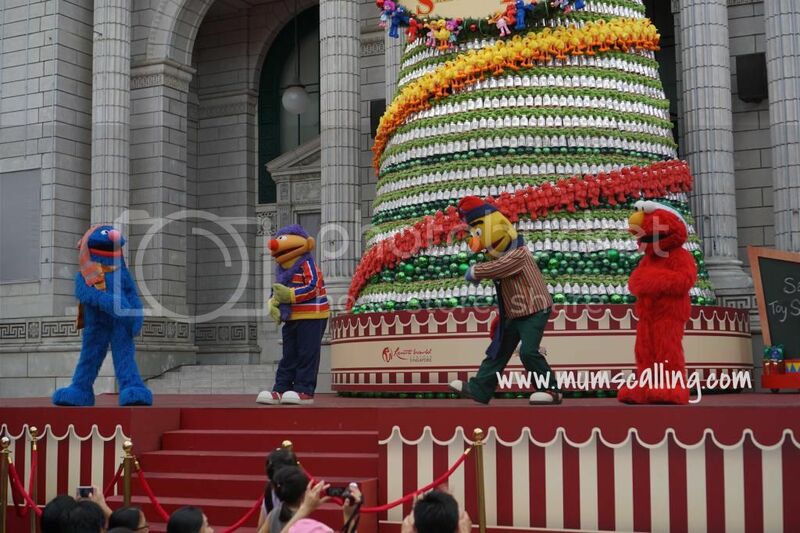 Get up close to sing and dance along with the Sesame street casts who will hop off the stage individually after their performance, for meet and greet. No idea why, the show was very much delayed. About 10 minutes with no announcement given. Our trait of punctuality issue is dominant everywhere. We ended our night with Santa's toy soldiers show. There was also a meet and greet opportunity at the end of it. Again, show doesn't start on time. A bad waiting game. We were then beautifully farewell by snowfall! We had a great time of immersed fun, and the kids survive the park with no naps or signs of lethargy. We had a very late dinner to buy more play time within the park. The restaurants within closed pretty early, much before the official closing time of the park. It quickened our decision to dine out of the park. We headed out of the park for dinner at Coca, which was extremely bad tasting because of its horrible service and attitude. Aww... a good dinner would have been a better wrap. Nonetheless, we know nothing beats to spending quality time together as a family! Jare was extremely happy that he could get on more rides this time. And for being at the age of terrific three, his entrance was free. Awesomeness for being little. For offering senior citizen rate, I could play filial by getting my parents in too! Theme park is for everyone. USS has really magical Christmas programmes this season. If you are thinking when to visit USS, this snowy Christmas celebration is probably the best time of the year to tour it. If you are hoping to get some thrill on our world's tallest duelling roller-coaster, Battlestar Galactica, it's still running under tests. Rumours has it that it's re-opening soon. But no one knows when. And of course, if you think spectacular fireworks must complete your theme park experience, visit it on Fridays, Saturdays or Sundays. Fireworks will spark off at 9:30pm. Show times and meet and greet timings are available for pick up near the park's entrance. Good guide for park planning. Valid for visit from 1 Dec 2014 to 4 Jan 2015 with extended hours from 10am to 9pm and 31 Dec from 10am till 1am. Inclusive of a Christmas set meal voucher. Do note that Christmas extended hours is not applicable on 19 Dec 14. There's also an option to buy tickets for entrance to park from 5pm onwards, if you aren't intending to spend a full day in. Christmas event ticket is priced at $50. Valid for visit from 1 Dec 2014 to 4 Jan 2015, 5pm to 9pm. I had really wished this was a sponsored post, but nah, another good things must share post. USS is a local pride! You ought to be there, at least once. Having said that, I will still say much love is left in Hollywood's Universal studio and Orlando's Universal studio. 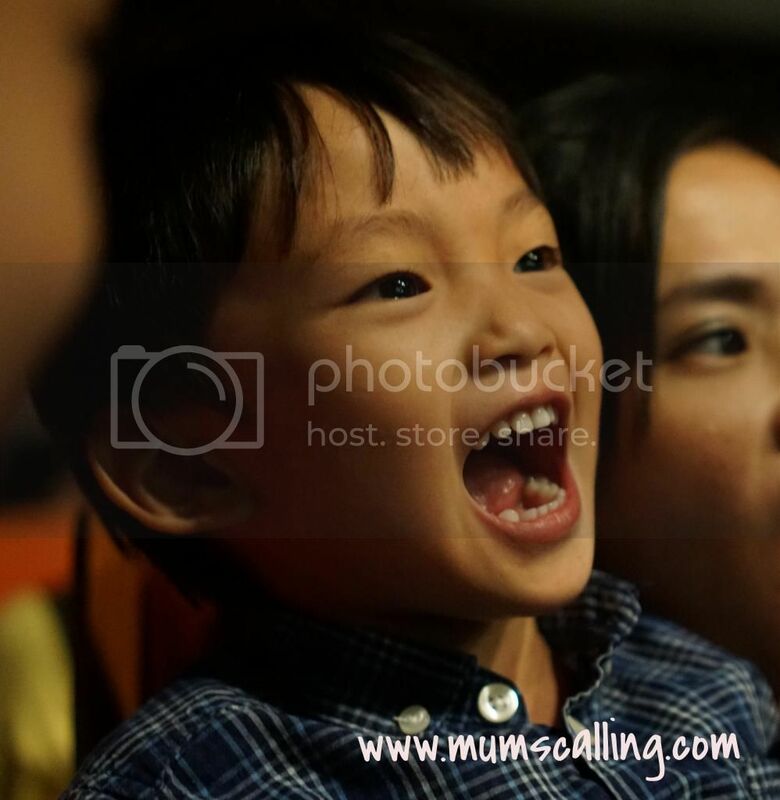 We had a rail-ly good time with the Chuggington team at City Square Mall last Sunday. Where we met the chuggers, Wilson (Red train), Koko (Green train) and Brewster (Blue train). They are Jare's favourite and yes, he spends a little portion of his time on the Chuggington cartoon. Which also explained the bugging buzz in my ears throughout the whole of last week about wanting to meet them. We finally did! Stage hosts, Lorie and Morgan brought the kids through a series of sing and dance along to the familiar hits like "Ready to roll" and "We're the Chuggeneers". All the kids were geared up to chug along. Super lively. The performance was staged much similar to the TV series where they shared about the values of teamwork, responsibility, environment and sustainability. Js enjoyed the session very much! Hint: This is where you should sit for a touch of snow during the show. To redeem a meet and greet photo opportunity, simply spend $50 in the mall. Maximum of 3 same-day combined receipts from any store except pushcarts and non-tenant atrium events. Redemption at L2, customer service counter on a first come first serve basis. 50 passes will be given out 1 hour prior each show. After or before the show. Do also check out the other happenings at City Square Mall, especially its park. We were specially captivated by the lightnings and decorations when we drove past it that night. Glad we had time to stroll its park after meeting the chuggers. An evening stroll at the Chugg-ful of fun park makes it really beautiful to view and soak in the festive spirit. The colourful lightings stand out! Remember to bring your camera. We forgot ours, and had to work with our mobiles. Have a go on the carnival rides like carousel, heli jet, and chair swing. Each ride at $4 per child. There were also game stalls for play at a cost. A myriad of colours and dancing lights fill the air with snow! Stand your chance to win $100 worth of City Square Mall vouchers. Spot the Christmas tree and guess the number of bells used to dress it up. Ride the train around the park at City square mall. Price at $6 per child. Hopped on for some fun too! Thanks SPRG! Looking really magical eh? It's definitely a lovely place to visit this coming weekend with our little ones! Have fun! Catch a live musical handbells performance as they ring in the spirit of Christmas, with your favourite Christmas tunes. Let them delight you with the classic Christmas songs that are bound to warm your heart. Disclaimer: We were given a meet and greet opportunity, and ride on the choo-choo city express for the purpose of this review. All opinions and photos are solely our own. We had a rocking good time with the ever enthusiastic casts of hi 5! The hi-5 house hits tour to Singapore happened over the weekend, and it's sign of awesomeness when the tunes are still running in our head. 1,2,3,4, hi 5! Js had a wonderful time singing and dancing to the songs. The concert was brought through with lots of lighting, dancing, familiar songs, bubbles and big balloons for audience to interact. It was as usual presented in a very lively manner with colourful stage props. Somewhat like the episodes we see on TV, but with intensive dancing and singing because it's like a concert. It was also where they introduced their new cast, Tanika. While casts come and go, my personal favourite is still Stevie. Loyalty attracts! Chats and JupJup's (the puppets) appearances were short and few, which I thought they could loiter longer on stage as Js love them quite abit. I guess we do need more singing and dancing after all. Did you know Chats is voiced by their cast, Mary and Jup jup is voiced by Ainsley? I just found out. So yeap, Js had a lovely time with the casts. I do know a few of their hits, but Js were much better than me. They taught, introduced and brought me through the songs instead. We take turns to lead and teach after all. While they enjoyed their time, I enjoyed my time watching them sing and action to the songs. We had a rolling good time of music fun! Only thing was, the venue Star theatre didn't seem like an ideal place for kids' shows. View from the stall seats was highly obstructed because of the height of the chairs. The chairs were taller than most toddlers when seated or standing on the floor. Booster seats didn't elevate to a good height for toddlers and they were snapped up fast. I sighted many little kids playing to be giraffes, with some standing on their seats or taking seat on the arms of their chair. Other than that, it really is an awesome place to host events, with the outside and inside looking really impressive. I really love the easy-going nature of Js, the mindless and easily satisfied attitudes whom despite of imperfect views would tell me at the end of the show, that they enjoyed it very much! We hope to catch you live again next year, Hi 5! Shared previously about the group here too. 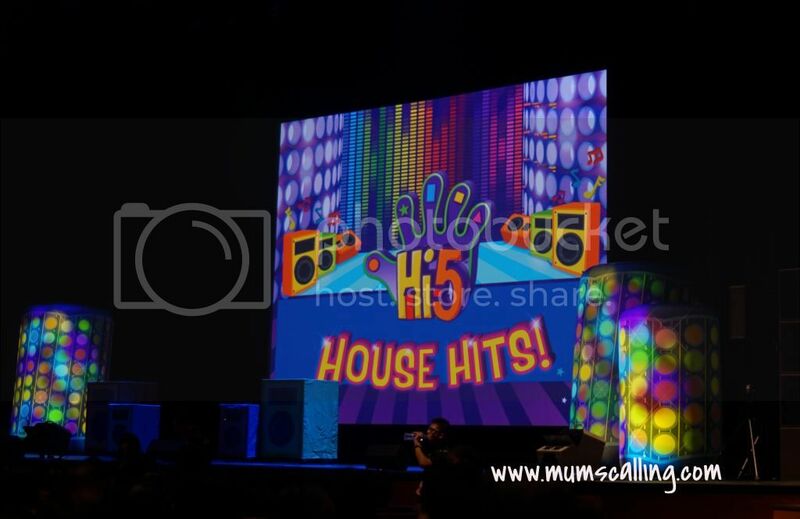 Disclaimer: We were given tickets to the Hi-5 house hits. No monetary compensation was given. All photos and opinions are solely ours. We talked about water displacement, we talked about mass, volume and that things take up space! Too excited, all because it was our first official science experiment. 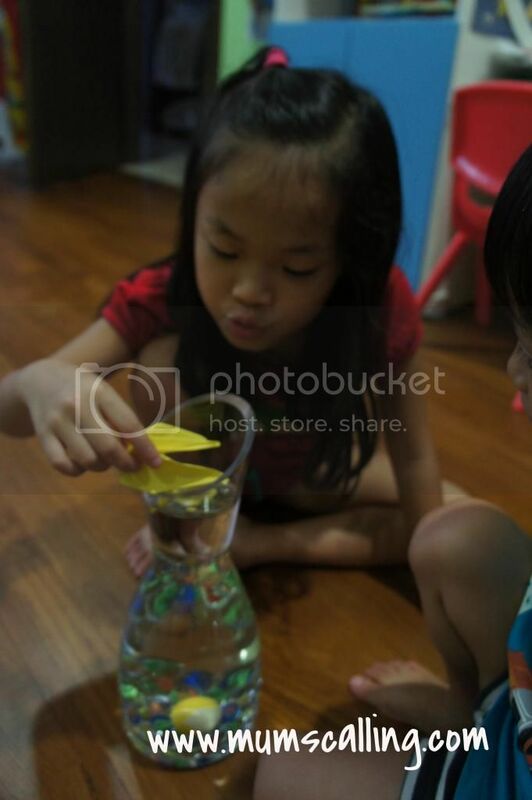 Inspired by a Chinese storybook we read, 乌雅喝水 (crow drinks water), we created a scenario and played a scene out of it. 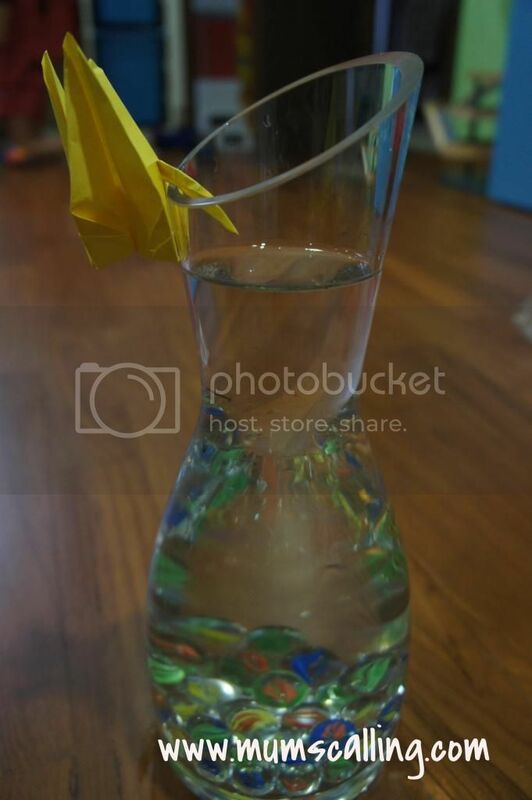 I folded a paper crane as prop for the crow, gathered marbles as stones and a glass flask to contain 3/4 filled water. Gotten a big crow instead! 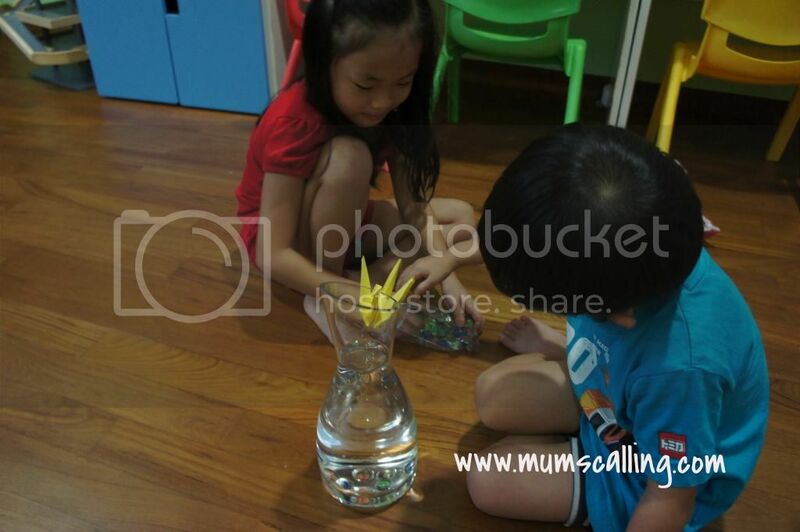 Interestingly, before I could start lesson proper, Jazz saw the apparatus and went, "I know Mummy, these marbles take up space in the water and the water level gets higher." Oh yeah, so science is for any age! OK, it was from the story that she gained these insights. 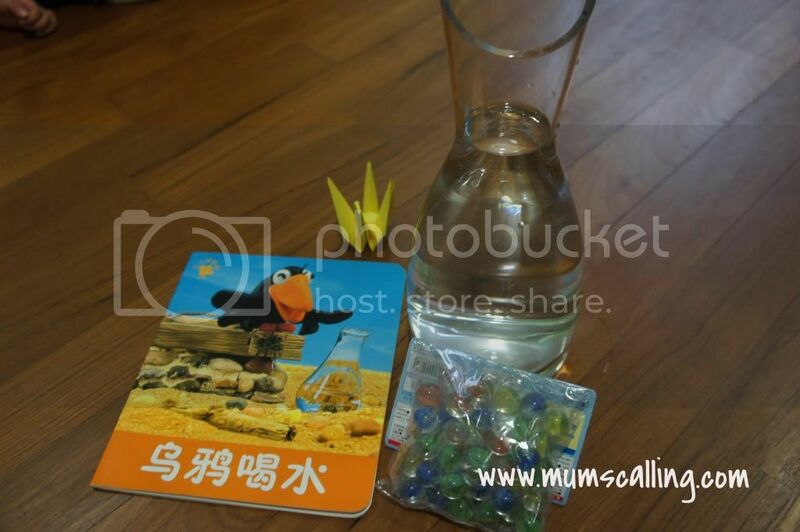 I stationed my crane at the top of the flask, gave it a very long beak just so the water won't overflow in the hands of my enthusiastic kids. I marked the initial water level before they began to drop marbles one at a time. We then marked the new water level after immersing all the marbles. 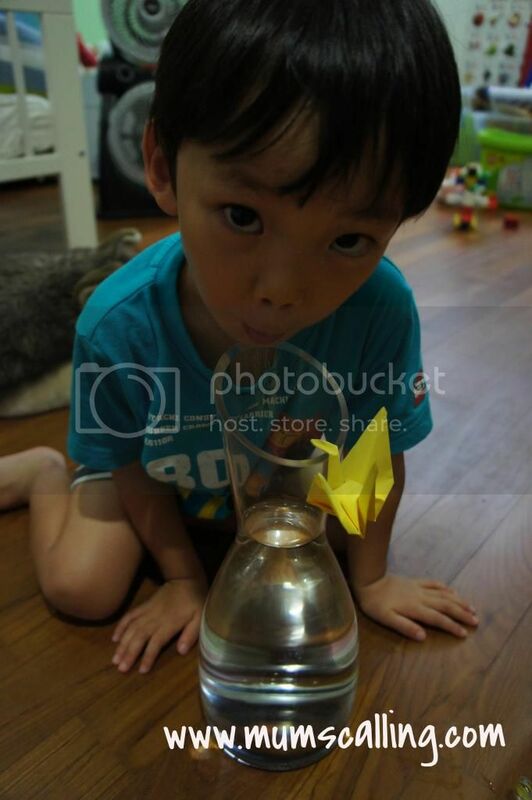 Oopsy daisy, little crane is still unable to drink the water! I got Js to look into their toy boxes for something which they think would be of good volume and density to further displace the water level. And they found a tiny ball that would enter the flask and submerge. Good chance to talk about sinking and floating too. Oh yay, our crane quenched its thirst! It was a fun and mini science experiment we had. Js enjoyed and loved it very much. Give it a go too! It's the school holiday and Jazz is off her 4 hours daily school schedule till next January. I knew they needed some teaching, learning and creative moments out of home. I searched around for speech and drama classes and found Centre stage, where I embarked them on a 5 days Winter Wonderland holiday programme. 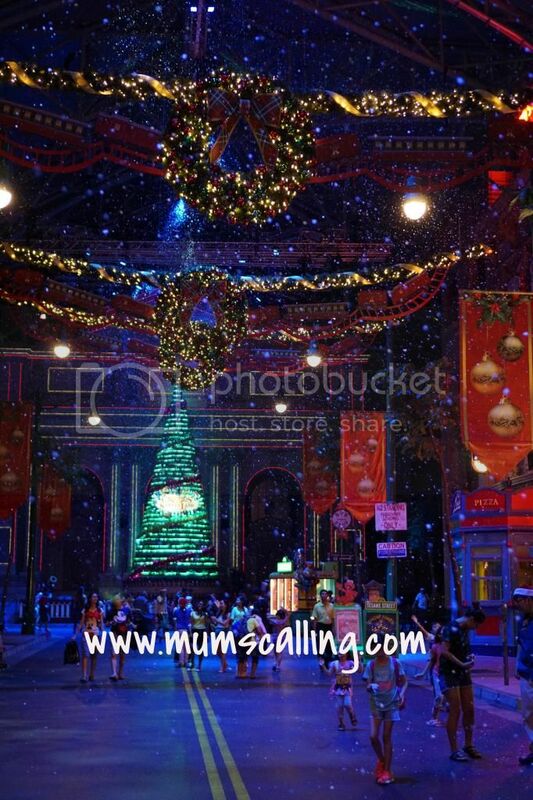 The Winter Wonderland programme intended for the ages 3.5 to 5 years old was a week of festive Christmas-creativity. They sang, dance, act, create, play, make, think and do the winter favourites inspired by Frozen, The polar express, The snowman and many more. It did sound like it was going to snow in the class. Most importantly, I thought it was just too perfect to have both Js in the same class at the same timing. Oh yay! 'Me time' to do my readings. I have to confess I made a blunder mistake of thinking it was a speech and drama concentrated class, till I read the programme highlights again. Oops! Oh well, what ultimately mattered was that they enjoyed it, at the end of its 5 days. 1. They have 3 centres locations, and the one that attracted me was the one in the east since we are staying in the east. Travelling time does quite matter. 2. They were established in 1999. Which is clearly some good years of teaching and experience under its belt. 3. Their teaching staff are of good credibility, holding a professional profile of both practical and theoretical experience. Most of which are native English speakers. Definitely a plus point too. 4. And of course, it was one thing to hold that portfolio of experience and qualification, but another thing to teach children as young as toddlers. I was comforted when I read about their school outreach programmes with some preschools in its lists. 5. Their client profile is mainly expats and rather diversify. I like exposing Js to a different environment from their daily and of diverse culture for learning and sharing. The school was founded by Peter and Alison who started their careers as two London based actors, and very soon found their work to be dominated by educational and children’s theatre. With a team of experienced facilitators, the aim was to create the “drama club” style of class so readily available in the UK, Australia and US. So yeap, Js ended their 5 days holiday programme on a high note. They sang and performed two Christmas songs. Their teacher, Fran had put in much thoughts and efforts in showcasing these little kids to their parents. You have no idea how much the homeschooling and stay home mum in me desperately wana watch my kids perform. It was also a query I asked before joining the class. Whether there would be any performance at the end. I mean, ultimately, from my parental view, that would be the most ideal evidence of self-confidence. Even if audience was little. Or perhaps, I need a reason to tear over little achievements like this. They did too adorably well! I asked Js what were they doing. They said they pretended they were in candy land, sailing in a river flowing with chocolate! Oh wow, I love that imaginary world they dived into. There were also storytelling, games, acting and lots of art and crafts! They graduated with a huge portfolio of Christmas crafty creations. Every class was planned to get playful and creatively messy. I heard lots of cheerful excitements from the outside. I also liked it that there were teacher assistants to help with the cleaning up just so there wasn't much idling time. Lots of craft in that folder! Apart from holiday programmes, Centre stage conducts weekly classes like drama, dance and music. Their weekday classes are good if your kids aren't on full day school or childcare. They hold some classes on Saturday, but not Sunday. Sabbath day is good for all. I like it that they would pro-refund your fees if you decided not to continue after the 3rd lesson. Nice thought in making this policy. I read this off their website, with 16 theatre productions a year – Centre Stage is one of the few arts schools that gives its students the opportunity to perform in front of live audiences in fully staged productions. I think if interest and commitment are well partnered, it's a nice to eventually have that opportunity. Interestingly, they do birthday parties too! Oh, I wouldn't mind a sponsorship on that. Haha! Check them out if you're keen! Disclaimer: We were given discount to the holiday programme. No monetary compensation was given. All opinions and photos are solely our own.